Truckee's Amie Engerbretson, pictured by her father Jeff, gets fresh turns at Big Sky in Montana. Engerbretson is one of several Tahoe locals who appear in Warren Miller's latest movie, "Chasing Shadows." 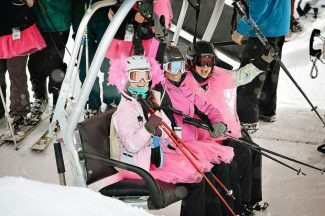 The movie is set to make its South Shore premiere at Harrahâs Lake Tahoe Friday and Saturday, Dec. 4-5. This weekend, take a glimpse into the world of professional freeskiing with a viewing of Warren Miller’s latest movie “Chasing Shadows.” The film features a handful of Tahoe skiers, such as Amie Engerbretson and JT Holmes, and is narrated by Squaw Valley Olympic icon Jonny Moseley. When: Friday-Saturday, Nov. 27-28. 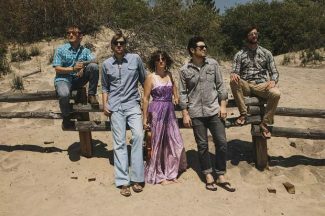 Doors 6:30 p.m., show 7:30 p.m.
Tahoe area favorites Jelly Bread will celebrate and recreate The Band’s farewell concert appearance, The Last Waltz, with a free show inside Crystal Bay Casino’s historic Crown Room. Experience the magic of holiday season by strolling through the Gingerbread Village and watching the Grand Tree Lighting Ceremony. The event will feature a visit from Santa and Mrs. Claus, horse-drawn sleigh rides through the meadow, and seasonal music performed by local youth. 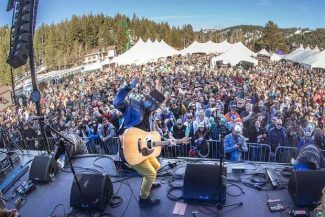 Visit the Village at Squaw Valley for its “Welcome to Winter Party.” The all day shindig includes big benefits for pass holders on merchandise and all-day events, including the Patagonia Grand Opening Party, beverage specials, live music and more. When: Events from 10 a.m.-5 p.m. Saturday, Nov. 28. Bring the family out for the Truckee Ice Rink’s opening day on Friday. Located in the Truckee River Regional Park, the Truckee Ice Rink features public skating, skate rentals, a snack bar, group and private lessons for all ages, and more. Versatile guitarist and vocalist Joe Grissino will bring his eclectic blend of rock, jazz, funk and blues to Cottonwood Restaurant for a free show Friday. Marty O’Reilly & The Old Soul Orchestra, a four-piece outfit from Santa Cruz, will bring their trance-based blues to downtown Truckee for a weekend of free shows at Moody’s Bistro, Bar & Beats. The Alder Creek Adventure Center at Tahoe Donner will open its doors to the public Friday with a grand opening party. This free event includes live music, appetizers, family entertainment and activities, and a no-host bar from 5-7 p.m. Plenty of funk and soul will cap off Black Friday at Lake Tahoe’s South Shore as Reno’s Mojo Green takes the stage at Hard Rock Hotel & Casino for a free show. Dream and Dreamer, a rock-and-roll duo hailing from Grass Valley/Nevada City, will play all the hits, past and present, during back-to-back free shows at Bar of America this weekend.